The Bentley Simons Runyan Family of Mansfield, Ohio an oil painting (circa 1857) by Frederick Elmore Cohen. 38 x 45 in. Used courtesy of the Allen Memorial Art Museum. Last week, I shared the location of this, the house depicted in one of my favorite Ohio paintings. Today, I'll illuminate something of the house itself and the people who lived there. In part three, next week, I'll bring everything together and provide some analysis as to what it all means. Boyd Addlesperger, local history librarian at the Mansfield / Richland County Public Library, was kind enough to email me with a copy of the following article. Esther Smith (Many Notables Walked Between Iron Lions of Former Cappeller Home on West Fourth, Mansfield News Journal, July 20, 1941) provides a wonderful history of the house and the families who lived in it. I've inserted several historic maps to help illustrate the changes to the propery. Note that in the maps, the front of the house is at the top of the image. My commentary is in italics. For almost a century the doorway at 93 West Fourth street has been guarded by a pair of crouching cast-iron lions. They were placed there when the big brick house was built by Bentley Runyan who came to Mansfield from Knox County in 1847. State and national figures have passed between them. Three Ohio governors, Joseph V. Foraker, George K. Nash and Asa Bushnell were frequent visitors at the home during the 25 years it was occupied by William S. Cappeller, publisher of Mansfield's first daily newspaper and prominent figure in Ohio Republican life. Warren G. Harding was entertained there during his campaign for presidency of the United States and John Sherman often called at the Cappeller home. One of the showplaces of the city at the time it was built, the old Runyan home was for several years the only house that stood in that particular block on the south side of West Fourth Street. [detail] Plate B - Parts of Wards 1, 2, and 3, Atlas of the City of Mansfield, Ohio. E. Robinson & R.H. Pidgeon, Civil Engineers. Published by E. Robinson, New York, 1882. Used courtesy of Richland County, Ohio USGenWeb. The lot is seen here in 1882. The brick house, shown in Cohen's painting, is in red, while the barn, to the rear, is in yellow. Note that the lot remains empty of other structures. Commodious rooms prevailed throughout the house and the downstairs boasted both a parlor and sitting room, bedroom, a dining room that ran the width of the house, kitchen and pantry besides the various extensions that served as woodshed and ice house. Upstairs there were a series of bedrooms making a total of 14 rooms throughout the entire house. Numerous changes have been made in the house since then but one feature that remains the same, a beautiful spiral staircase that extends from the reception hall to the third floor. As unique in local architecture today as it was originally the staircase has a narrow walnut banister supported by a newel post and slender spindles whose fragile appearance belies their sturdiness. As long as the Runyan family occupied the house few changes, if any, were made, according to Mrs. George A. Mead, 65 Blymyer avenue, a granddaughter. 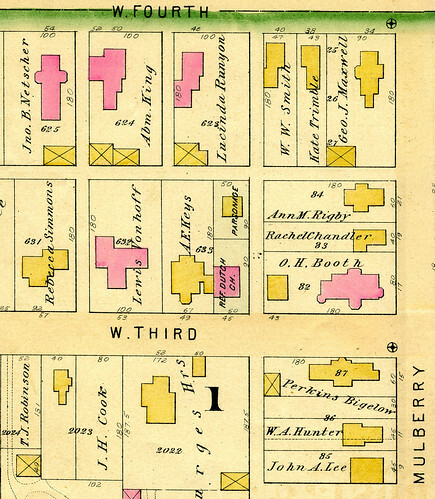 [detail] 1887 Sanborn fire insurance map of Mansfield, Ohio. See also: the full map. While the residence and carriage house remained essentially unchanged, the lot was split in two by 1887. 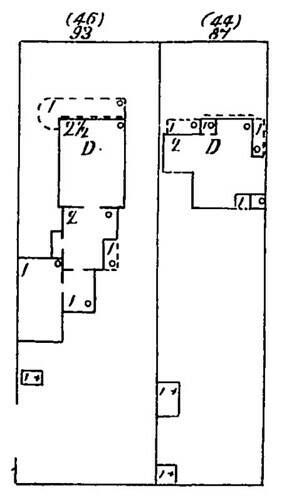 The area shown as the garden in Frederick Elmore Cohen's painting had a house sitting on it by the time this map, published in 1887, was printed. 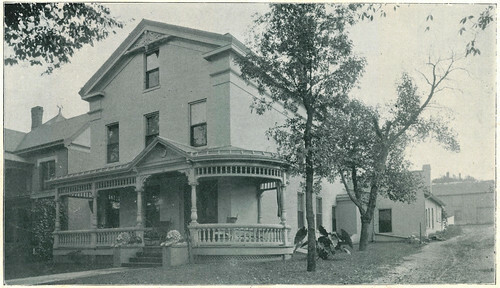 Residence of W.S. Cappeller, No. 93 West Fourth Street. Reproduced from The County of Richland, Ohio (1896). Published by Rerick Bros., Richmond, IN. Used courtesy of the Richland County Historical Society. The facade was first altered during the occupancy of the Cappeller family by the building of a verandah that gave an added appearance of width to the front of the dwelling. An oil painting of the home and Runyan family at the time the children were small now hands in the home of a granddaughter, Mrs. James McCullough in Oberlin. A photograph of the painting is in Mrs. Mead's possession. The house was kept in the Runyan family until the two sisters, Miss Mary Ellen Runyan, who had established the first private kindergarten in Mansfield, and Mrs. Almeda Parsons and the latter's infant daughter, now Mrs. McCullough, were the only occupants. Mrs. Parson's husband had recently died and she and her sister sought a more compact dwelling. W.S. Cappeller and his family came to Mansfield from Cincinnati in 1885 while Cappeller was commissioner of railroads in Ohio. [detail], 1897 Sanborn fire insurance Sanborn map of Mansfield, Ohio. See also: the full map. Early in the residency of the Cappeller family (by 1897) the barn to the rear of the lot was removed. Scene of many social gatherings from the senior Cappeller's political and public life, the home for the next 25 years was also a gathering place for the friends of the sons and daughters. There were three grown children at home then, William G. Cappeller, now dead, a bookkeeper in his father's Daily News; a daughter, Nora, now the wife of W.M. Congwer of Cleveland, and E.B. Cappeller, then a student at Cornell university and now living in Cleveland. Antique furnishings were used throughout the house, Mrs. Flora G. Cappeller, 111 Sherman avenue, widow of W.G. Cappeller, recalls. Two choice pieces, belonging to her husband's grandmother, Mrs. Mary Cappeller, a dresser and a chest, are now in her possession, and also the silver water chariot that was presented to W.S. Cappeller at the time he retired as treasurer of Hamilton county. In 1911 W.S. Cappeller died and his widow dismantled the home and went to Cincinnati to live with a daughter, Mrs. Laura Doran, now a resident of California. Since that time the house has been occupied by a Mansfield physician, Dr. D.W. Peppard and his family. [detail], 1914 Sanborn fire insurance map of Mansfield, Ohio. See also: the full map. Between 1909 and 1914, the lots were split up, and new houses were built on the rear half of the lot. By 1921, a garage had been added to the lot of the house behind the Runyan house. 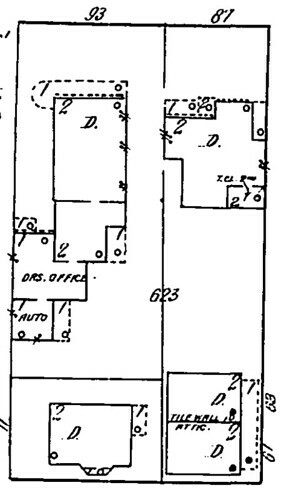 No further changes to the footprints of the structures show up on the 1929 or 1949 Sanborn fire insurance maps. More extensive improvements have been made by the Peppards than in any year prior to their occupancy. Additional windows have been installed to let in more sunlight. New fireplaces have been built in practically all of the downstairs and upstairs rooms that were originally equipped with mantels. Part of the space in the large dining room has been appropriated for a modern kitchen while a rear screened-in porch with a floor has been built to the east for an "outdoor" dining nook where every meal in the summer time is a picnic, Mrs. Peppard said. Dr. Peppard's office now occupies the extension that was formerly the old Runyan woodshed and that now runs along side Cappeller court. Seldom has there been a time in the history of the house that there have not been young people in it. The Peppards reared a son and three daughters there and it was only this summer that the last of their children, William D. Peppard, married and moved to his own home. Be sure to tune in next time, for the final part of this story, where I'll make some sense of everything that's been revealed about this family and the place they called home. For as long as I can remember - since the mid-1990s at least - this painting has caught my attention when I've visited the Allen Memorial Art Museum, in Oberlin, Ohio. As I became interested in Cleveland area architecture, the painting became noteworthy as an early depiction of a house in color - how can one miss that bright green? Now I see it as a very special document. 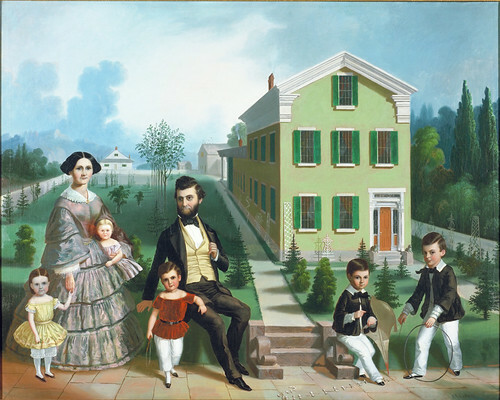 The Bentley Simons Runyan Family of Mansfield, Ohio, a painting made circa 1857 by Frederick Elmore Cohen is arguably the best Ohio family portrait. It goes beyond merely depicing a man, a woman, and their five children - the level of detail in the image provides us so many details about how they lived and what they felt was important. 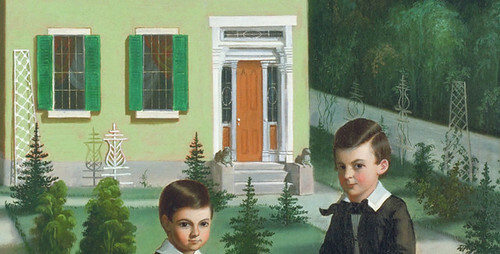 Detail, Bentley Simons Runyan Family of Mansfield, Ohio an oil painting (circa 1857) by Frederick Elmore Cohen. 38 x 45 in. Used courtesy of the Allen Memorial Art Museum. The yard is well manicured, with a variety of trees, some so small that they still have cages around their bases for protection. Trellises of a couple different designs line the side and front of the house, as well as the right edge of the yard. A lattice is attached to the side of the house near the rear. To the rear of the house, there's a barn and a smaller structure, both gray in color. To the left of these, a one and a half story building, painted white. Looking more distant, we can see what appears to be a hill, or perhaps even a mountain. Looking at the house itself, we first notice the color - a bright green where we're used to seeing white. Looking closely, we can make out the texture of brick underneath the green paint. From the two chimneys, wisps of smoke are visible. And then there's the grand front door, flanked by a pair of lions. Draperies appear present around all of the windows. Finally, there's the family! They're clearly of some means, as they appear well-dressed. One can see that Bentley Runyan's left arm used to be pointing, as if to say "this is mine". And what stories might the children tell? We knew what city the house was said to be located in, but, it seemed, nothing more. I had to, at the very least, try to put this scene on a map. Rather than reinvent the wheel - which I seem to do more frequently than I should - I sent an email to Andria Derstine, director of the Allen Memorial Art Museum, asking if they had anything further in their curatorial files on the painting. There was an article, Artist and Patron: Frederick Cohen and Bentley Runyan by Marcia Goldberg, which appeared in the Allen Memorial Art Museum Bulletin, volume 37, number 2 (1979-80), pages 79-87. Goldberg notes (page 84) "The Runyan house was the showplace of Mansfield when it was built, probably in 1852 or 1853. It stood alone for some time on a large fenced and landscaped plot at the base of a hill (just visible to the left) on the western edge of town." 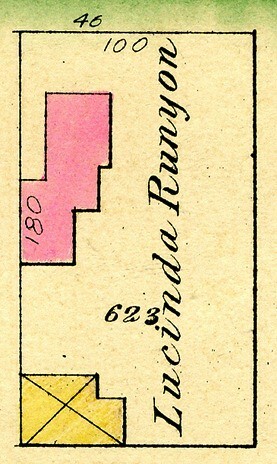 The 1850 U.S. Census indicates that the Runyan family, living in Madison Township, Richland County, owned real estate worth $2,200. A decade later (1860 U.S. Census), they were living in Mansfield Township. There were five children (ages 13, 11, 8, 5 and 1), and they were of sufficient means to employ a laborer and a domestic. The value of their real estate had jumped to $25,000. With this information in hand - a large estate (as suggested by the value of the real estate) and a vague location (the west edge of Mansfield) - I knew just where I might find the answer to my question. Large-scale maps illustrating land ownership and the locations of houses were producted for more than half of the counties in Ohio in the 1850s and 1860s. My working bibliography of such maps indicated that, while such a map had been made for Richland County, it wasn't among those that I knew to have been digitized. [detail], Plate B - Parts of Wards 1, 2, and 3, Atlas of the City of Mansfield, Ohio. E. Robinson & R.H. Pidgeon, Civil Engineers. Published by E. Robinson, New York, 1882. Used courtesy of Richland County, Ohio USGenWeb. Fortunately, the 1856 Map of Richland County, Ohio had been digitized by Richland County Ohio USGenWeb. Alas, the map of Mansfield was not included. After some fumbing around, I came across the 1882 Atlas of the City of Mansfield, Ohio. Someone had been kind enough to index the names on it, and finally, I hit paydirt! Take a close look at the south side of W. Fourth, about a block west of Mulberry. Looking more closely, we see a house belonging to "Lucinda Runyon" - the wife of Bentley Simons Runyan, and who is illustrated on the left side of the painting. 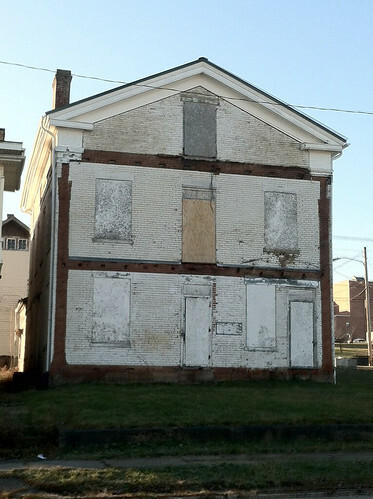 The house is painted a red hue - indicating that is brick (a frame house would generally be painted yellow on such a map). 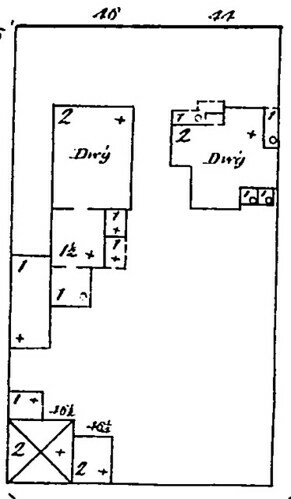 Further, the footprint is approximately what we'd expect for the house as shown in the painting. Finally, there's a yellow building - a barn or carriage house - in approximately the right location. Photograph used courtesy of Jennifer Gray. I took a look at the site in Google Maps, hoping that the structure might still be standing, which would confirm my hypothesis that this was the house in the painting. What I saw looked promising. Streetview confirmed that it was, in fact, still there! This photograph illustrates the house. It's brick, and the proportions appear correct. The windows and door on the front were in the same location as those in Cohen's panint. But it's not the house in the painting. In my excitement, I went a bit too far on West Fourth Street. The Runyan house was a block to the east. I put a call out on Facebook, asking for a photograph of the house, before I realized it was no longer standing. Alan Wigton, President of the Richland County Historical Society, was among the first to respond. He did end up pointing out my error - but he also provided this photograph of the house, taken in 1896. A massive front porch was added, and a bit of gingerbread had been affixed to the peak of the gable. The 8 over 8 windows present in 1857 were replaced with 1 over 1 ones and the shutters were removed, too. Note the lions on the front stoop. They seem a bit large for the space where they're sitting, I think. They appear to be the lions in Cohen's painting! Enough of the house. Who were the Runyans? This passage (History of Richland County, Ohio (1880), pages 730-731) provides as complete a background on the Runyan family as I've been able to find. RUNYAN, BENTLEY S. (deceased). The subject of this sketch, who was one of the active and prominent business men of Mansfield for over twenty years, was born in Knox Co., Ohio, March 6, 1821; he was the eighth child of Hill and Mary L. Runyan, who were old residents of that county; in the month of April, 1847, he removed to Mansfield, where he opened a hardware store, near the southeast corner of Walnut and Fourth streets; in the fall of the same year, he changel his location to a room south of Fourth on Main street, where he remained until after purchasing the building south of the present European Hotel, in which place for many years he did a large and extensive business, it being the chief hardware store in the city. During his residence in this city, he was prominent in all public and charitable enterprises, and his name was generally found at the head of the list of those citizens who petitioned and subscribed in the interest of the city and its inhabitants; he was one of the founders of the Mansfield Gas-Light Company, and served as one of its officers, and was elected on an independent ticket as Mayor of the city, in which capacity he gave universal satisfaction; for many years he was an active member and oflicer of the Richland Co. Agricultural Society, the success of which was due in a great measure to his efforts. He was married in Mount Vernon, Ohio, to Miss Lucinda Murphy, of that place, Jan. 14, 1844; five children by this marriage are living - John Beatley, now a resident of Tiffin, Ohio, where he holds the position of Teller in the Tiffin National Bank; Charles C., of the firm of Bush & Runyan, plumbers and gasfitters in this city; Robert Mead, iron-roofer and painter now in the employ of the Aultman & Taylor Co., and two daughters Almeda and Mary E.
B.S. Runyan died in this city Jan. 12, 1869; R. Mead Runyan was married in Mansfield Jan. 20, 1875 to Miss Ida Boyle; two sons were born to them - Frank born in 1876, died March 18, 1878; Harry was born Jan. 15, 1877. Part 2 of this narrative, which will explain more of the history of this house and how it changed over time, will appear next week. 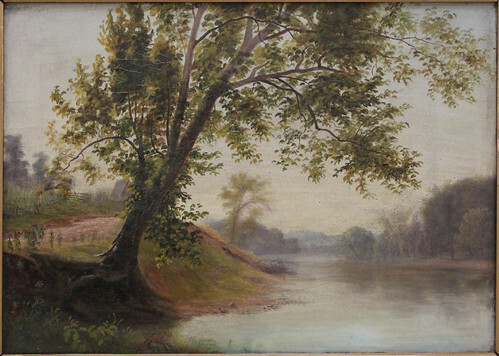 The Great Miami River, an oil painting (circa 1850) by either Elizabeth Frankenstein or Godfrey N. Frankenstein. Image courtesy of the Clark County Historical Society. Photo by Sandy Bialik. Sometimes, when an image is good enough, or when it simply speaks to the people of a given place and time, it takes on a life of its own. Such is the case with this painting, by either Elizabeth Frankenstein or her brother, Godfrey Nicholas Frankenstein. 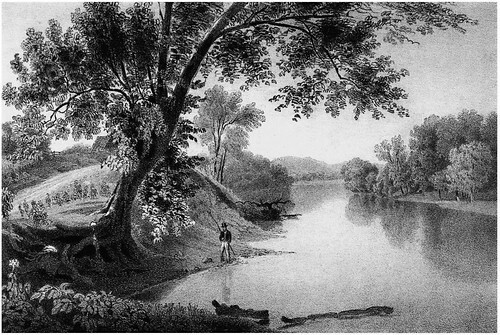 The painting, The Great Miami River (circa 1850) depicts a scene near Cleves, Ohio. Cleves is a town in the very southwest corner of the state, about seven and a half miles from where the Great Miami empties into the Ohio River. Detail, Map of Hamilton County, Ohio, a print (1856) by A.W. Gilbert. Used courtesy of the Library of Congress. 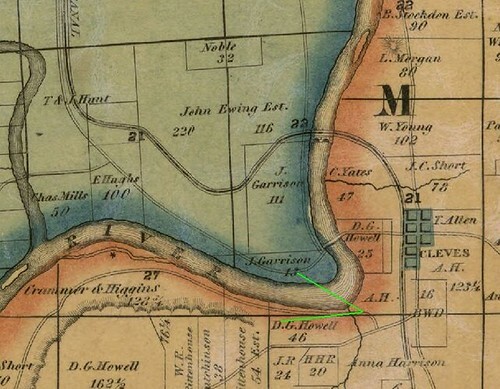 Based on the information available, Frankenstein's painting appears to have been made in the location shown on this detail of Gilbert's 1856 Map of Hamilton County, Ohio. It's the only place in the vicinity of Cleves where the road comes close enough to the water and one has an unobstructed straight view down the river. The view is looking approximately west, as shown by the green lines drawn on the map. View on the Great Miami, Near North Bend, a print (1851) by Onken's Lithography, after a painting by Godfrey N. Frankenstein. 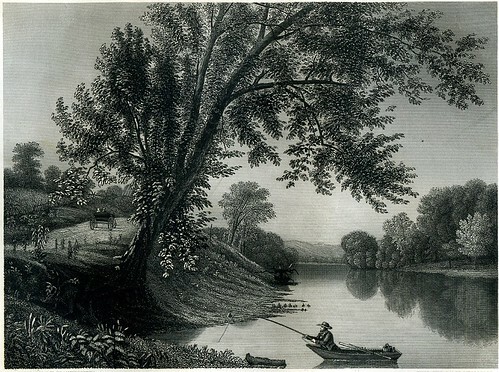 Published in Western Scenery; or, Land and River, Hill and Dale, In the Mississippi Valley. (1851) by William Wells. Used courtesy of the Public Library of Cincinnati and Hamilton County. The image was reproduced by Onken's Lithography in this 1851 print, with the additon of a man fishing. View On The Great Miami (Near Cleves, O. ), an engraving (April, 1857) by William Wellstood, after a painting by Godfrey N. Frankenstein. Published in The Ladies Repository, April, 1857. Used courtesy of The Philadelphia Print Shop. It was reproduced again in the April, 1857 issue of the Ladies Repository, which was published in Cincinnati. In this image, the man fishing is in a boat, and a cart has been added on the road. 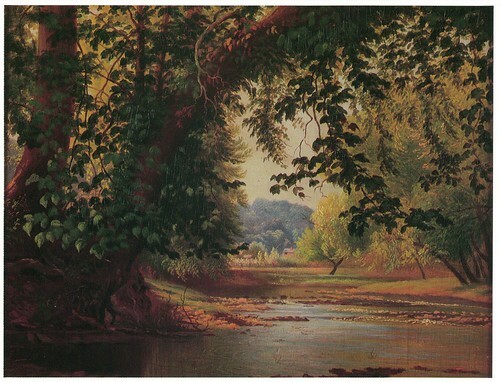 Mill Creek Near Cincinnati / Great Miami River near Cleves, an oil painting (1847) by Godfrey Nicholas Frankenstein. Used courtesy of Cincinnati Art Galleries. Reproduced from Panorama of Cincinnati Art II, 1850-1950 by Cincinnati Art Galleries. 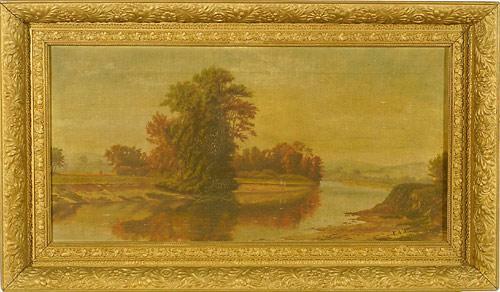 To help confuse things, another painting (1847) by Godfrey N. Frankenstein has sometimes been listed with the title Great Miami River near Cleves. At others, it was listed as Mill Creek at Cincinnati. A print of the subject was published with the title Mill Creek at Cincinnati giving credence to that name. Note that the body of water in this painting is much shallower than in the other images. I'm unsure as to whether this depicts the Great Miami River or Mill Creek. Whichever case, it's not the scene depicted in the lead painting. 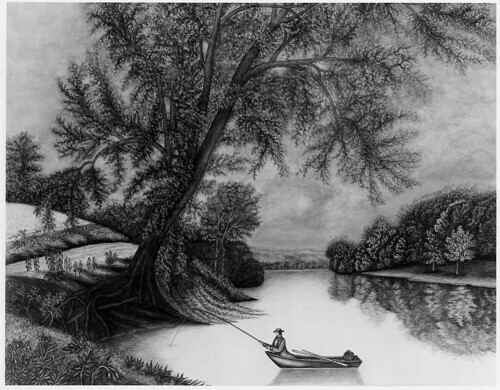 Fisherman on the Harwinton, a drawing / watercolor painting (1857 or later). Used courtesy of the Museum of Fine Arts, Boston. Imagine my surprise when I saw this image, Fisherman on the Harwinton, in the M. & M. Karolik collection of American water colors & drawings, 1800-1875. A quick search revealed Harwinton to be in Connecticut. 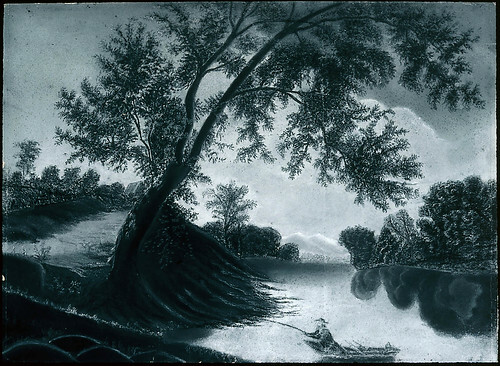 Fisherman on the Harwinton, a chalk drawing (1857 or later). Used courtesy of the Museum of Fine Arts, Boston. I'm sure that the two works titled Fisherman on the Harwinton are based on the print published in The Ladies Repository, in April, 1857. What, then, made someone think that they were of a scene in Connecticut? I suspect that oral tradition held that one of the works depicted a scene near Harwinton, Connecticut. This somehow (as oral tradition tends to do) became a scene on the Harwinton. When another work with an identical composition came into the Museum of Fine Arts, Boston's collection, it was obvious that it was after the same original - and so received the same title. Out of curiousity, I checked the two gazetteers from that period that I could readily locate - John Hayward's 1839 New England Gazetteer and John Chauncey Pease and John Milton Niles' 1819 Gazetteer of the States of Connecticut and Rhode-Island. While both listed Harwinton as a place name, neither listed it as the name of any sort of body of water. Ohio Landscape, an oil painting (circa 1860-1870) by Robert Seldon Duncanson. Used courtesy of Cowan's Auctions. This painting, by African American artist Robert Seldon Duncanson, has been referred to as Ohio Landscape. The subject matter appears to be the southern part of the state, where Duncanson worked. His most notable Ohio landscape is Blue Hole, Little Miami River (1851), which I'll address in a future story. Landscape & Covered Bridge, an oil painting (1888) by E.A. Sumner. Used courtesy of Cowan's Auctions. While Duncanson's painting dates to the 1860s, it seems to have been exhibited somewhere in the 1880s or 1890s, as at least two paintings based on it were created during that period. This 1888 canvas by E.A. Sumner copies the original composition almost exactly, save for the omission of the person and boat in the foreground. Ohio River Valley Landscape with Town, an oil painting (1894) signed "M.P.W." Used courtesy of Garth's Auctions. This 1894 painting focuses on the centre part of the image, also omitting the person and boat. While, as a work of art, Duncanson's painting may be appreciated without knowing this, and even as it relates to history it can be telling in some ways, there's much that is left unknown by the inability to name the location depicted. Place matters. It matters both for what a work can tell us about the subject, but also what it can tell us about the artist by his or her choice of that place. We can revisit a location and learn what liberties the artist took and how that location has changed in the intervening years. In short, I really really wanted to identify the subject of this painting. I consulted with some colleagues with the hopes that perhaps they might have some idea as to the location. Shirley Wajda came up with a strong argument for Nelsonville, a city in Athens County, Ohio. Dangerous Bend, Hocking River, Nelsonville, Ohio, a postcard. Used courtesy of Athens County Public Libraries. Wajda was familar with the area through previous research. She located this postcard, which does appear to show the subject. There's the covered bridge. The curve of the river is just about right, as are the the locations of the buildings and the hills in the background. It was the best possibility that I'd seen - and it satisfied me that we'd identified the site where Robert S. Duncanson made the painting as well as could be, short of actually visiting it. Early Autumn on Esopus Creek, a chromolithograph (1861-1897) by Alfred Thompson Bricher. Published by L. Prang & Co.. Used courtesy of the Boston Public Library, Print Department. Time passed. As part of the research for Early Visions of Ohio, 1765-1865, I've been looking at a lot of books (more than 2700 at last count), many that include historic imagery of areas outside Ohio. 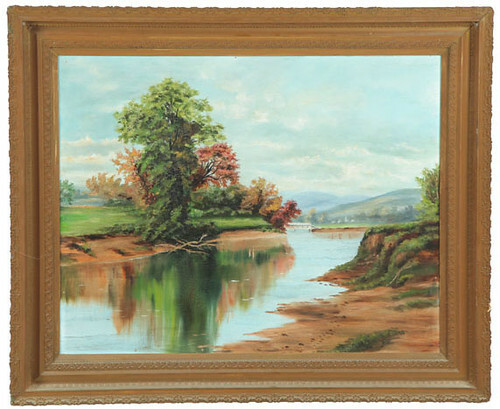 In one of these titles, I came across this print, Early Autumn on Esopus Creek, a chromolithograph (1861-1897) by Alfred Thompson Bricher. The most likely Esopus Creek is in Ulster County, New York. The geology of that area is consistent with the subject depicted in the painting. My initial thought was that Duncanson based his painting on Alfred Thompson Bricher's print. Now I'm no longer so sure. The two other paintings of the subject have clouds that are consistent with Bricher's print, not Duncanson's painting. This means that the artists likely made their paintings while observing the print. Since they date so close together (1888 and 1894), it suggests to me that the print they were using as a reference had been printed recently. Based on the style of Duncanson's painting, I'm inclined to believe that he executed that work in the 1860s, as has been suggested, or perhaps a little earlier. This would suggest that Bricher's print was based on Duncanson's painting, not the other way around. So the painting is of Esopus Creek? The only landscape of a New York subject that I know of by Duncanson is Niagara Falls (1863). This is at the opposite end of the state from Esopus Creek. That said, Robert S. Duncanson painted at least a couple paintings of New Hampshire, the travels for which would have put him close enough to Esopus Creek. On the other hand, it's not inconceivable that Alfred Thompson Bricher might have given the subject a title that would sell better - there would be more demand for a New York landscape than an Ohio one. 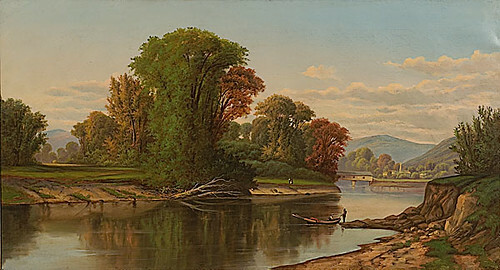 There's a great example of this in a painting by Godfrey Nicholas Frankenstein, of the Great Miami River near Cincinnati. A pair of paintings done after that image are described as being in Connecticut - but that's another story. It's not clear where this subject was painted. It'll take field work and more research to know for sure either way.